The skin of the tiger is mainly yellow ochre with white areas on the belly and head. Then there are the characteristic black tiger stripes lying in great swathes round the body. For several years I have studied the earth colour ochre, as I consider that this colour comes closest to the natural colour of the tiger’s skin. In the great ochre pits of the south of France one can see a graet range of colour tones, stretching from the pale pink, over greenish, yellow and orange tones, to the deepest red and dark purple – caput mortuum. the word ‘ochre’ is presumed to come from the Greek ‘ochros’ i.e. pallid or pale yellow – a slightly incorrect name because of the ochre colours great strength of colour. The raw material, which is mainly of clay coloured by yellow, red or reddish brown iron [forbindelser], occurs in smaller or larger concentrations all over the world. They can vary considerably in colour – for example from the yellow or yellowish brown of Italian Terra di Sienna, to the red or reddish brown Spanish ochre. The colours can also vary greatly not only between the geographical locations, but within the individual local occurrence. The strong sunlight which falls on the yellow or reddish yellow banks lights up brilliantly and contrasts vividly with the cerulean blue of the sky. The dark green pine trees that grow in these areas are covered in a fine ochre dust, which is constantly whirled up by the wind, so that it almost blankets the natural colour characteristics of the vegetation. But mainly it is the richness of nuances in the ochre material itself which is important and it is a great inspiration for me in my painting. The ochre colours can in sunlight nearly compete in intensity with the synthetic yellow, orange and red colours, while in theshade they become subdued yellowish brown colours. 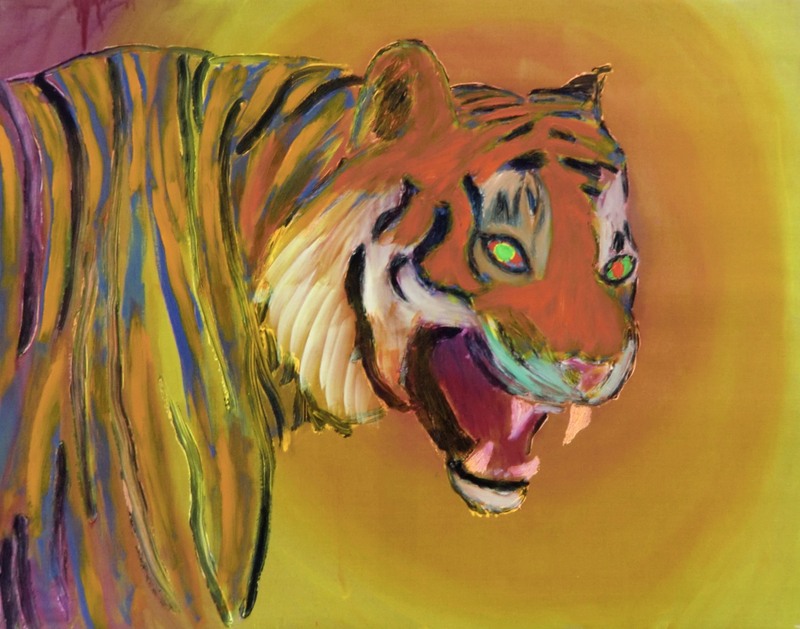 In the same way the tiger’s golden brown skin lights up in the sun, while it can converge with the surroundings because of its combination of stripes and subdued tones. Here is indeed a contrast which suits this temperamental beast down to the ground. There is a difference between what you see and experience in nature and what you feel as a painter in front of your easel and have to convert these often contradictory ideas or feelings into pictures. You have to get inside the material itself and in that way find out what you really want to do. The way I use earth colours is an attempt to use them as one sees and perceives them in nature in different lights. Through systematic research I have throughout the years discovered a way to compensate for the weaknesses that occur when the paint comes into the studio, in the form of a tube, from where it can be squeezed out as a brown substance on to one’s palette. At the Academy of Art in Copenhagen it was forbidden to mix the cheap earth colours with the very expensive cadmium paints. We were supposed to either paint with earth colours or the spectral colours, and not mix the two systems together. The three well-defined earth colours I use are yellow ochre, raw Sienna and red ochre. 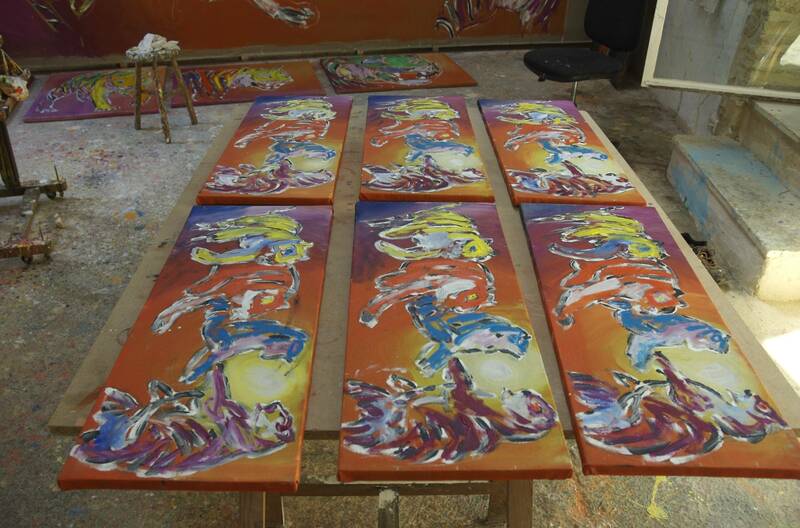 To increase the intensity of the ochre colours they have to mixed with a related pure colour. A yellow ochre has to be mixed with a warm yellow cadmium colour, a raw Sienna has to be mixed with cadmium orange, and the red ochre with a light cadmium red. White is added in the amount you desire depending on how light the colour is to be. On the other hand a mixture of a colour with a different colour value and an ochre colour will not be suitable in this connection. Instead of increasing the ochre colour’s intensity it would transmute it into a different colour completely. If you try to mix lemon yellow to yellow ochre, the green of the lemon yellow will dissipate the warm yellow in the ochre colour, in the same way as mixing a warm yellow cadmium colour with a red ochre will turn it into a more orange tone, and therefore change it in a different direction than was desired. Besides this it is absolutely necessary to use the purest pigments mixed with a suitable [bindemiddel] to achieve the desired results. 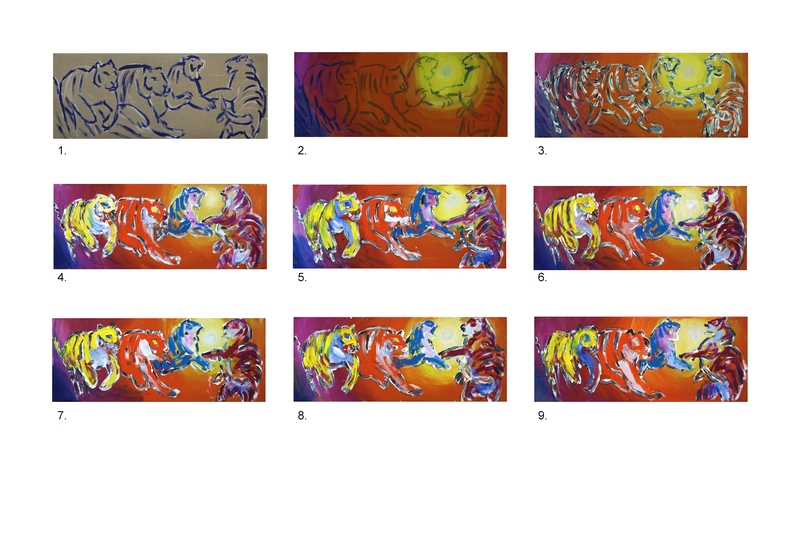 With these colours which stretch from being subdued and passive, on a sliding scale to being highly active, it is actually possible to paint a tiger in its different temperaments. Every stage which a wild animal can be in. Tigers fighting, playing, copulating, hunting and consuming their prey, etc. At the same time it affects oneself, so that the inner powers that control the painter’s instincts are released. They are powers of nature akin to those that control the instincts of the animal of prey. Several years ago a French psychiatrist visited my studio. 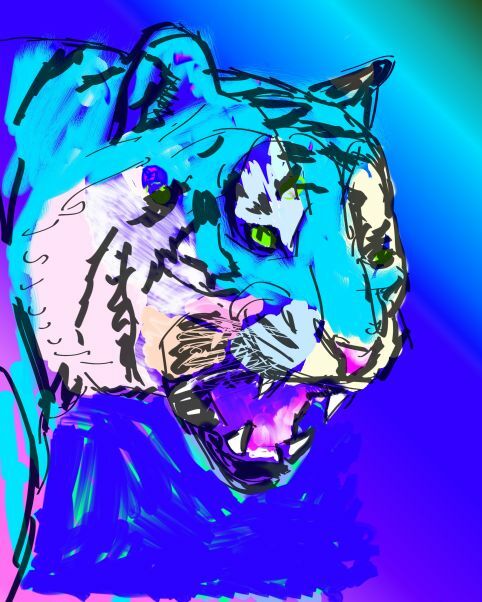 He mentioned that my tiger paintings did not actually depict animals but people.